Cables for your guitar—how to tell what to plug in. How do you tell which cable to plug into your guitar? The single separator between the two conductors, the black ring tells you that this is your guitar cable. Since it is two conductors and not shielded, you do NOT want to have a long run of this cable unless you want the signal to pick up interference. 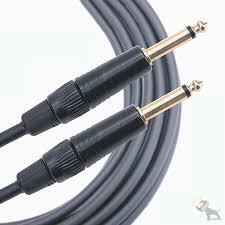 Cell phones, Amps, and other electrical equipment can degrade a signal badly, so don’t run 100 feet of guitar cable. If you need to make a long run, us a DI Box which converts the signal to a line level signal and transports it (generally speaking) over an XLR cable which can have LONG runs without significant degradation of the signal of picking up external interference. 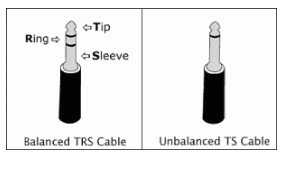 These two different types of cables are often mistaken for one another and the graphic below shows the difference between the two in graphic form. Short runs and plugging into pedal boards, pedal effects, or directly into amplifiers. No longer than a few feet—especially in a performance environment. Trying to find out where that loud hum is coming from can drive you crazy and you’ll likely make the sound engineer unhappy if he or she finds you’re using a 50 foot TS cable to go from your guitar to your pedal board which is right in front of you. Long runs, balanced with little or no interference. This plugs directly into a mixer which will go into a PA or other equipment which will output sound. When in doubt, count the black rings. ONE black ring means TS which is GUITAR cable. TWO black rings on the connector means it is balanced three conductor line level cable for direct plugging into a mixer. IF you need a long cable run from your guitar, consider using a DI box which converts the signals back and forth—see your friendly neighborhood instrument store for more info and prices. And when in doubt, always ASK before you plug something in. Jeff Moore is a guitar instructor for Peak Music Lessons in New York. He teaches guitar lessons in Cohoes, NY . Jeff is passionate about the fusion of guitar and voice in rock, metal and other forms of musical expression.